What's your earliest memory from your childhood? Just how far back can you actually remember? What will be my son's first memory? How can I ensure that it's not a memory of me as the ultimate hot mess express? How can I make sure that he actually remembers any one of the amazing memories I try to create for him every week? I'm hoping that when my son grows older and searches the vast depths of his childhood he remembers, at least, a small glimpse of this past weekend. And really, I'm not asking for that much considering that he was at the Georgia Aquarium, in a moving tunnel, surrounded by some of the world's most incredible creatures, underneath the wings of a stingray that probably would not fit into our family room? 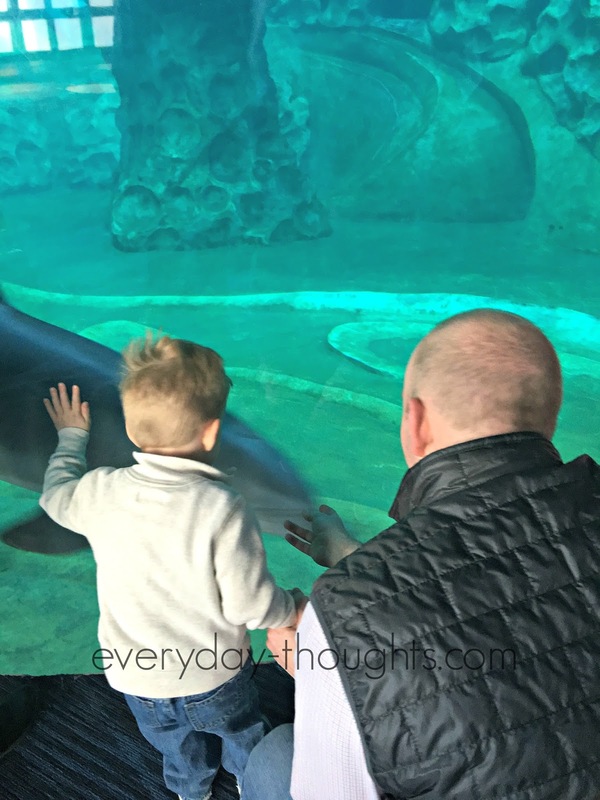 Our Sunday morning experience at the aquarium was an absolute blast and a must see for anyone that plans to visit or lives near Atlanta, Georgia. I've now had the pleasure of going to the aquarium during two completely different life stages; most recently as a mom and during my first visit, back in 2009, as a dating couple with my now husband. Both experiences were equally fulfilling and truly made for an awesome adventure. 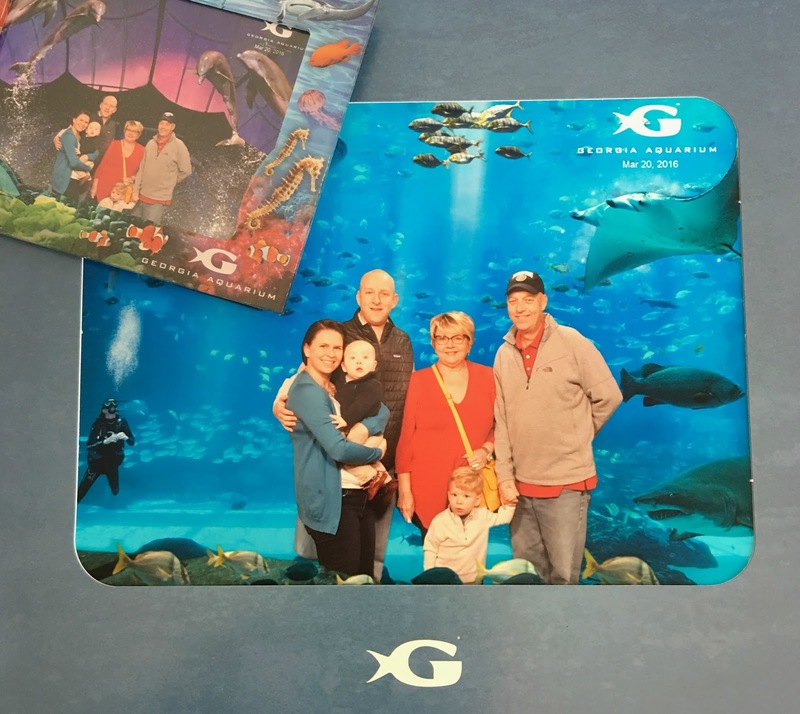 Before getting into any specifics I would say that going to the Georgia Aquarium is worth a visit at almost any age. All the adults in our group had been to the aquarium previously, but it was the first time for both of my children - ages three and almost eight months. It was the absolute perfect age to take my three-year-old. But if you're weighing your options for out-side-the-home activities for children under the age of three, I might wait. The reason I say this is because it is a bit of an investment at $36.95 for adults (ages 13-64) and $30.95 for children ages 3-12. It is free for children under 3, which is a bonus, but at almost $40 for an adult, I personally would wait and not spend that amount of money until I knew my children would remember and enjoy the experience. I should mention that there are plenty of ways to get discounts on tickets so be sure to scour the interweb if you plan on visiting the Georgia Aquarium in Atlanta. We decided to go to the aquarium early on a Sunday morning - we saved 20% on tickets because we were there within two hours of it opening and we bought the tickets online. Personally, I think this was a good call on my husband's part, the children were awake and alert, the lines were short and parking was plentiful. We left right when things started to get busier downtown. When I went to bed Saturday night I was like a six-year-old on Christmas Eve, I literally couldn't sleep because I was so excited. So when we arrived I was downright jittery. Before you walk through the aquarium doors you have a chance to get your picture taken in front of a green screen. This happens quickly so beware - but if you're so inclined, you can purchase the pictures at a booth inside. We did buy the picture package which cost about $35. It included an 8x10, a 4x6, and two smaller sized prints and matching magnetic photo frames. In my opinion, it was worth the money to remember the experience but if you're on a budget this is a novelty that you might want to skip. Once you walk into the air-conditioned venue, you'll find yourself in a large atrium that connects each of the different sections of the Georgia Aquarium: River Scout, Coldwater Quest, Dolphin Tales, Ocean Voyager, Tropical Diver, and coming March 31 - Sea Lions. There is also a very clean and well-lit cafeteria with plenty of hot and cold options, a banquet area upstairs and clean bathrooms with plenty of room and changing stations. We went directly to the Sea Lions, who are on special display until their exhibit opens at the end of March. Instantly my oldest son was captivated and I knew at that moment that he was going to love his experience that morning. 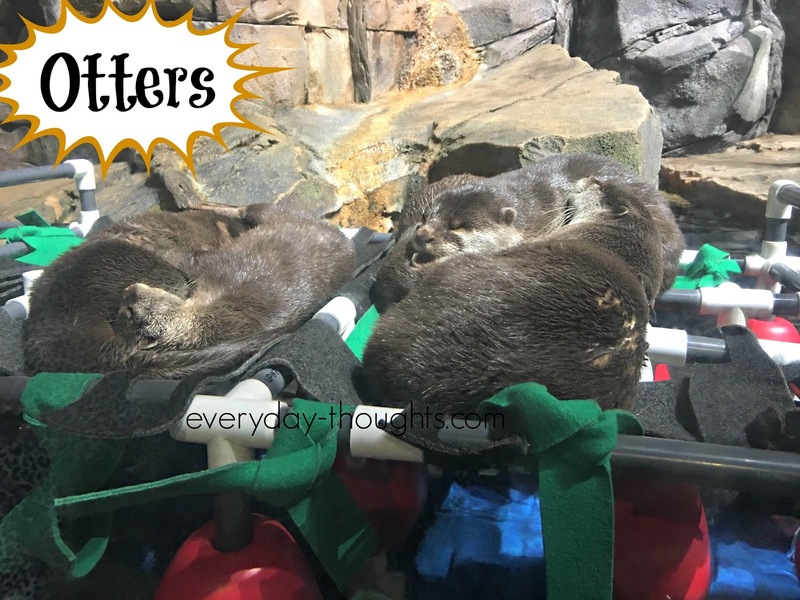 We made our way through the section of the Georgia Aquarium named River Scout which is home to the American Alligator, tons of amazing fish and river creatures and the most adorable group of otters you may ever lay your eyes upon. It was quickly evident that the architects of the Georgia Aquarium clearly had children in mind when they put their design in motion. There are small entryways, secret bubble viewing glasses, and hallways through which only the tiniest guests can walk. Next, we headed up the escalator to the Dolphain viewing area. We did not see the show Dolphin Tales but as an Atlanta resident, I've heard nothing but great things about it. I do know that photogrpahy at the show is strictly prohibited. But if you, like us, decide not to go to Dolphin Tales, make sure you check out the dolphines in their tank. It's an absolutely amazing experience to be in such close proximity to these beautiful sea creatures. The dolphines swim very close to the glass and it seems almost like they know you're there and they are swimming by just to say "hi." You cannot take strollers into the dolphine viewing deck but there is a stroller parking area just at the bottom of the escalator. Following Dolphin Tales we stopped by the cafeteria to grab a couple coffees and some quick snacks. - got to keep the kids fed so they wouldn't get cranky. We did not have any of the prepared food but I can say it smelled amazing and I'd have no trouble ordering something off the menu. The dining area was impecably clean and I felt very comfortable eating there with my children and family. There was a small gift shop off to the side of the cafeteria in case you want to take home a token from your trip. We also made a potty break and I took my potty-training son with me to the women's bathroom. The bathrooms were very clean and there was an attendant in the bathroom during both of my visits. Coldwater Conquest is home to the penguins, which is what my son was most looking forward to seeing. I know I've said it several times, but it really is amazing that we have the opportunity to stand so close to such magnificent creatures. I had the blessing of watching my son's face as some of his favorite cartoon characters took on their true form. The penguin display is fairly large and there is a kids tunnel that runs underneath the arctic area so that kids can explore and play. 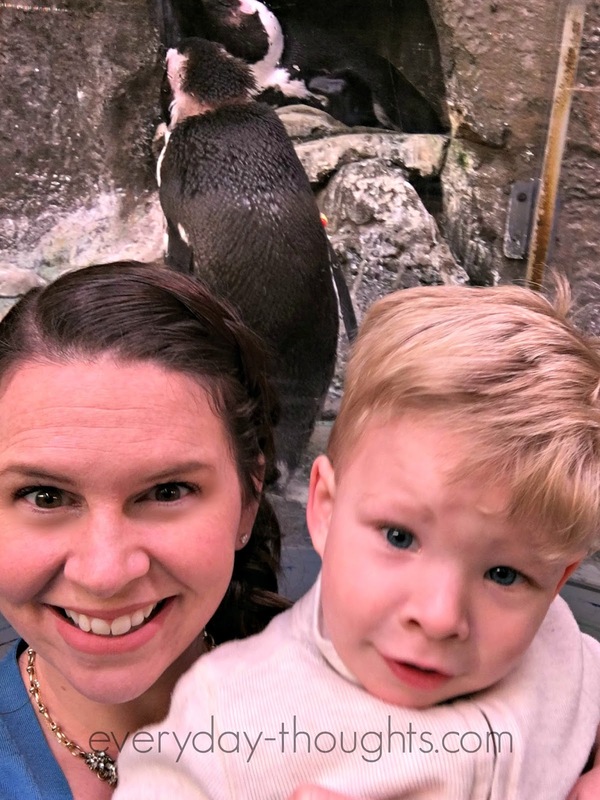 On one side of the tunnel there are two viewing windows that allow you to literally put your head in the middle of the penguins habitat - so naturally we took a penguin selfie. In my opinion, the highlight of the entire Georgia Aquarium experience is the Ocean Voyager area. 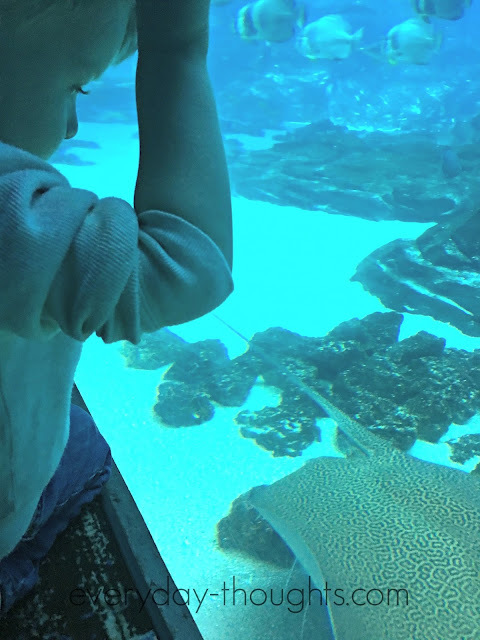 It's a huge tank that hosts a variety of stingrays, fish, turtles, sharks, whale sharks and many other creatures. There is a huge observatory that allows you to relax and sit down while you watch the oceanic life circle but to get there you walk (or stand on a moving platform) through a tunnel that completely surrounds you. You are literally emerged - without getting wet - into the mock ocean and it's mind boggling. If you want to see just how amazing this exhibit is you can visit the aquarium to take in the full experience but if it's not going to fit into your schedule this week they have a webcam you can check out here - set it to music and it's pretty mesmerizing. Once we finished here we thought we were done so we packed up, met a couple of the fluffy, costumed creatures that walk the atrium and yes, took one more trip to the potty. It was at that point that we realized we have completely neglected to check out an entire section - Tropical Diver. Think tropical reef, colors and complete beauty and it might give you a good idea of what to expect. The jellyfish, the Nemos and Doris, the waves and the colors. Oh, the colors. Make sure you don't miss out on this part of the aquarium. 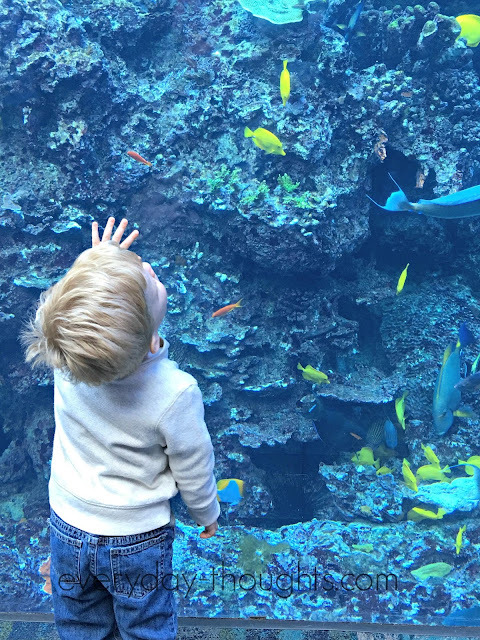 If you follow me on Instagram then you might have seen this picture and it pretty much sums up how both my son and I felt as we wandered the halls with all the sea life - complete awe and wonderment. We hit up the store on the way out and there was plenty to distract your children choose from. My son got a small toy and we headed back to the covered parking garage. All in all, the trip could have been more successful. We will be back and we can't wait to take our youngest son again when he can remember some of the beautiful flashes of fins and gills. Until then we are happy to reminisce on the turtles, pretend to walk like a penguin and dream about dolphins. 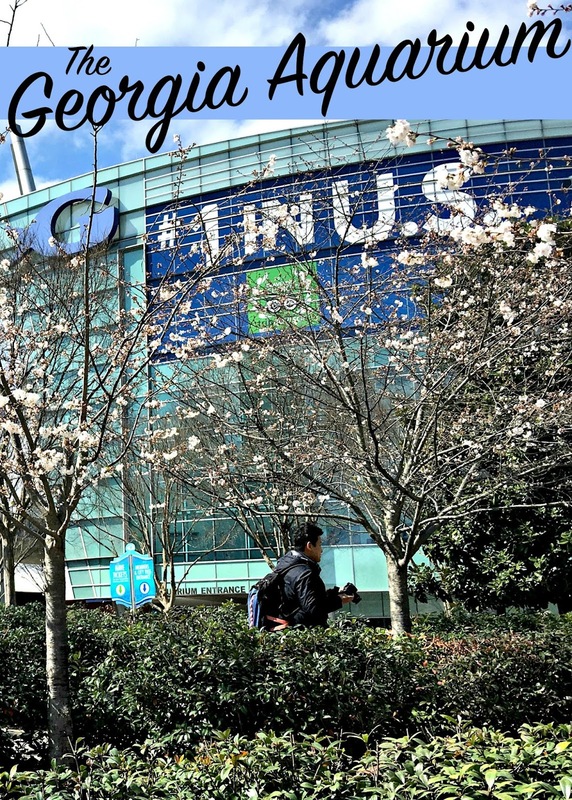 If you've been to the Georgia Aquarium I'd love to hear about your experience in the comments below.